This magnum-sized fixed-blade ninja knife takes its blade and handle shape from traditional karambit knives, and incorporates that concept with a fixed-blade combat knife. The wide, upswept blade features a sharp curved edge for supreme slicing power. The ergonomically contoured handle features comfortable finger grips and an open-hole pommel design just like traditional karambits. Buy 2 you won't regret it! Beautiful knife with a real nice finish. 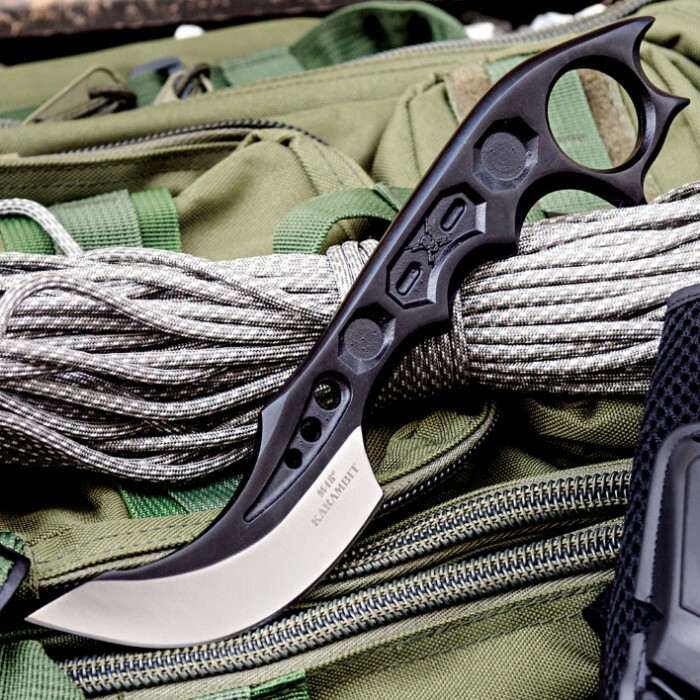 The problem with this knife is unlike traditional karambits, this knife has an up-swept blade which really eliminates the karambit fighting style. The knife itself is also very heavy and has no knurling for retention in high stress situations. This knife unfortunately is more of a showpiece than a combat tool. I would have given this 5 stars but I do not like the sheath. Problem is it's too short, when it hangs on my belt the pommel spikes stab me in the side, and it can pop out too easily as well. I really love the whole knife design including the spiked pommel just needs a better designed sheath. Blade is wicked sharp though, just like all my other m48 weapons. Just wish it had a longer sheath. 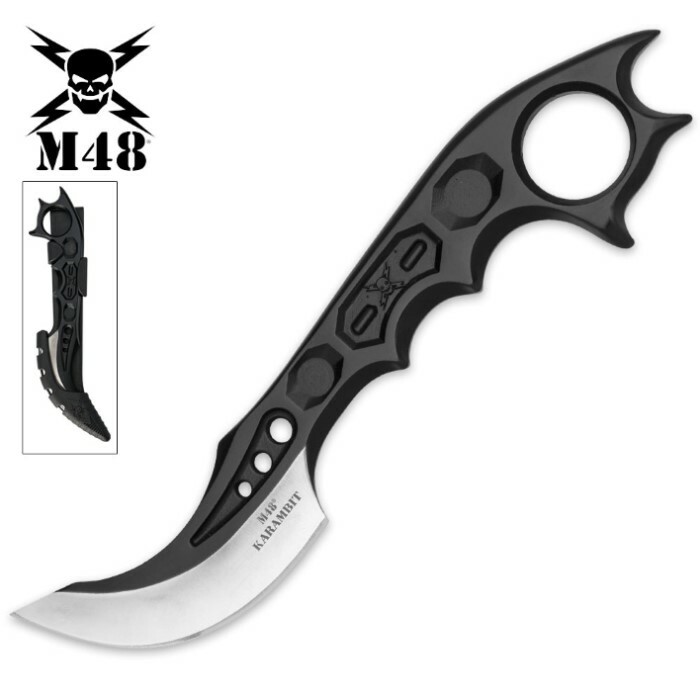 I just ordered this nice weapon and got it asap also it has some weight to it and I like it very much very excited to have and will order more also have no he straight razor karambit and it to has not let me down. this knife makes me poop my pants everytime I pick it up because it is so sharp.so I guess I could say that it is a very good knife!!! Let me just say that this is a very unique knife, as karambits typically do not have a blade in this direction, so that is pretty cool. And this is a great knife. One solid piece of metal, so it is very durable, and it comes out of the box pretty sharp compared to other knives I've bought online. Only complaint I have is that it is a little bit larger than I expected, but still manageable. If you want a sharp, unique, and durable knife with a nice karambit theme, this is the knife for you! Just got mine today and this is an amazing knife. Good weight and very good feel to it. The only problem I have is that I have purchased almost every karambit on this site and every single one comes with a left hand draw sheath. I am right handed and want one for my primary. Would still recommend this to anyone who asks. What a great back-up blade, very strong construction for a china blade, I would recommend this blade as a excellent CQB blade.